Please refer to our stock # 40G72-1882 when inquiring. New England Queen Anne maple highboy. Circa 1740-1760. Size: 70.5 inches ht. x 38 inches width x 20 inches depth. 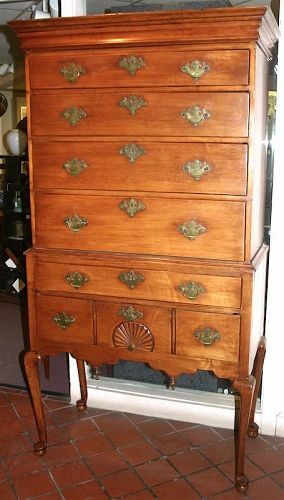 A New England Queen Anne period 2-part flat top highboy in solid maple with pine secondary. The upper chest has four graduated drawers, plus a 'hidden' drawer in the cornice; while the base displays a single drawer over a long drawer with the central section of the drawer front carved with a fan. The case is supported on delicate cabriole legs with pad feet resting on compressed ball terminals. The apron of the base is ornamented with a complex carved scroll design and a pair of turned pendant drops. Brasses are old replacements. Very nice older finish.